Pointe Fusion Was Nominated for the AVI Choice Awards in 3 Categories! It was honored to be appointed and very welcome for all staff and loyal friends to appreciate this beautiful venue. Over the years Pointe Fusion has demonstrated enormous dedication to Live Music cause. At the same time, it is an exciting elegy to love and friendship, the only valid means of support for maintaining joy in Second life. Whether you just listen or dance with your avatar, you'll find instrumental music, singers, big groups, soloists, pop, rock, classical, folk, jazz and all sorts of great music and musician and over all evenings that go till dawn. This wonderful Live Music place led by La Freese is a club that has soul. This little spot has a warm atmosphere and it is famous throughout Second Life for its vibrant music scene. My warmest congratulations it extends to miss La Freese, the backbone of this beautiful venue, for great perseverance, devotion and commitment with music and over all her simple acts of bliss and bond. 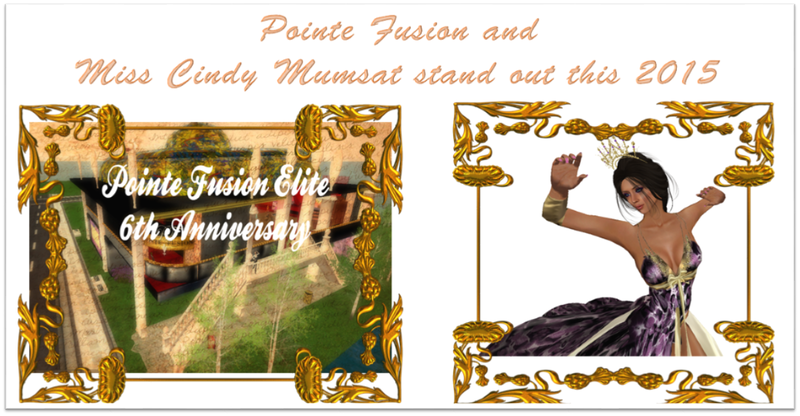 Also Pointe Fusion Elite celebrates its 6th Anniversary this last week February from Sunday to Saturday 28th, 2015. Staff members are kind and they ensure the excellent and individualized attention their fellows need at all stages of their treatment. For this reason, Miss Cindy Mumsat has been nominated as Favorite Host or Hostess in Avi Choice Award. She is a great hostess, relaxed woman, educated, attentive, warmly, lively and happy. I believe this aid merits our unanimous support. In this regard, I wish to place on record my appreciation for your hard work and dedication as a professional host. Our best wishes to miss La Freese and all her staff in this important day. We really appreciate the hard work supporting Live Music in Second Life and the unselfish help she has given to so many others in Second Life.